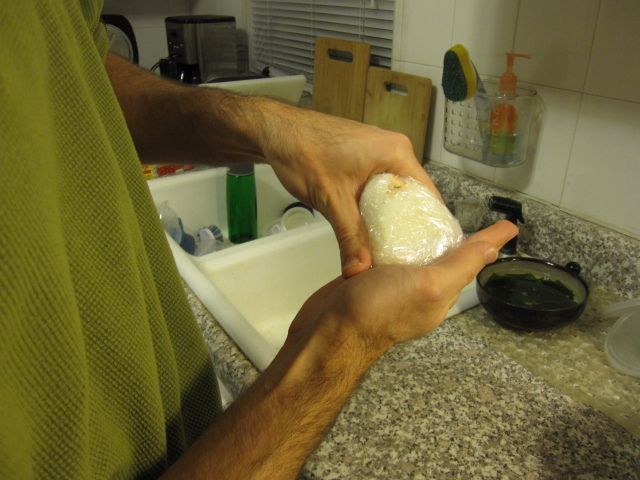 The other night we made Onigiri for dinner. Onigiri is great because you can pack in smaller amounts of protein which saves cash, while still making a very nutritious meal. It’s also fun to make and eat. 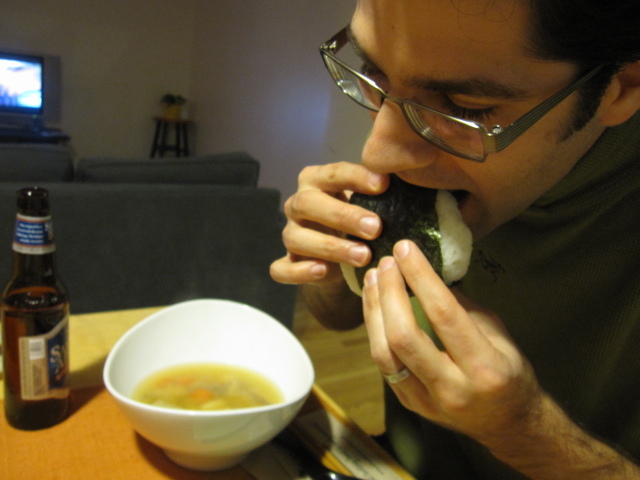 We commonly make Onigiri to take with on bike rides and hikes. Besides warm white rice the main ingredients are typically nori for wrapping and then some sort of cooked fish or dried seaweed. For the dried seaweed the idea is that the warm moist rice will kind of rehydrate it while leaving a little texture. 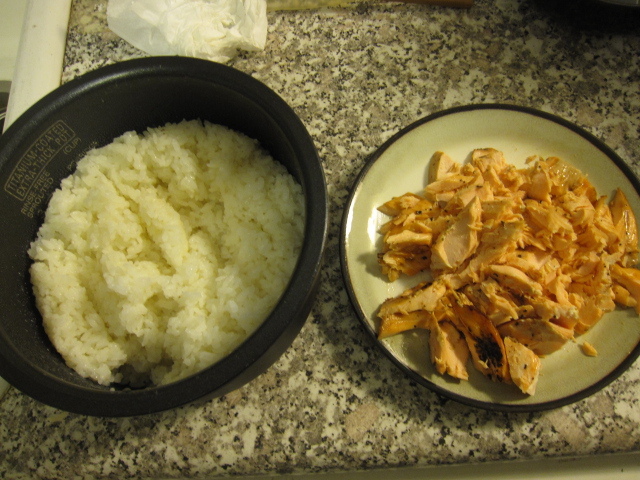 I used some salmon and some of these rice mixes, Mazekomi, that are available at most Asian grocers. 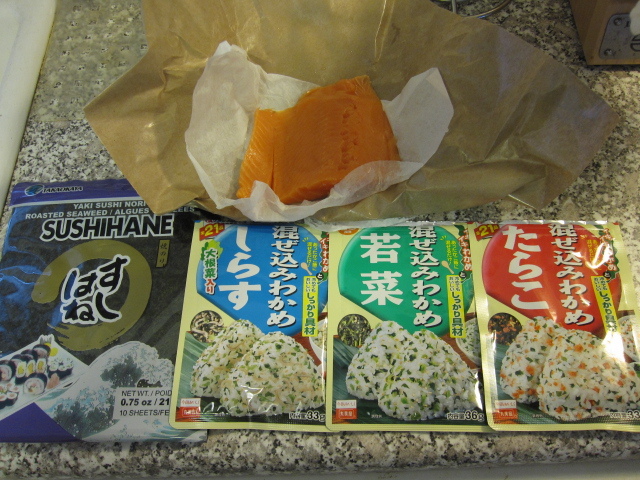 The mazekomi in our cupboard are wakame and sesame seed, wakame and cod roe, and wakame and dried sardine. 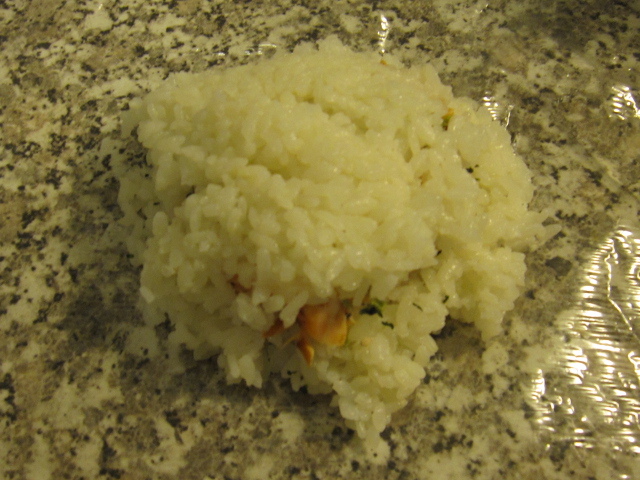 I made 2.5 cups of rice earlier in the day so that come time to make the Onigiri it’d be warm and not hot. I simply roasted the salmon with a splash of soy sauce at 350 degrees for about 15 minutes. Once it cooled down a little I broke it apart into pieces. On a piece of plastic wrap I put down a little of the rice and spread it out. Then I topped it with some of the salmon and mazekomi. I covered it with a little more rice. Using the plastic wrap I packed it down and formed it into a triangle. With 2.5 cups of rice you should be able to get 6-8 Onigiri no problem. To eat it you simply wrap it with a piece of nori (if you have the regular sushi width nori sheets you’ll want to cut them in half) and let your chompers do their trick. 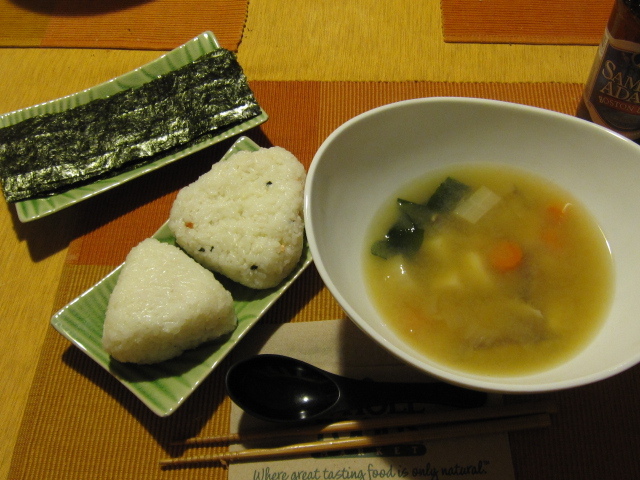 To go with the Onigiri I made some Miso Soup. 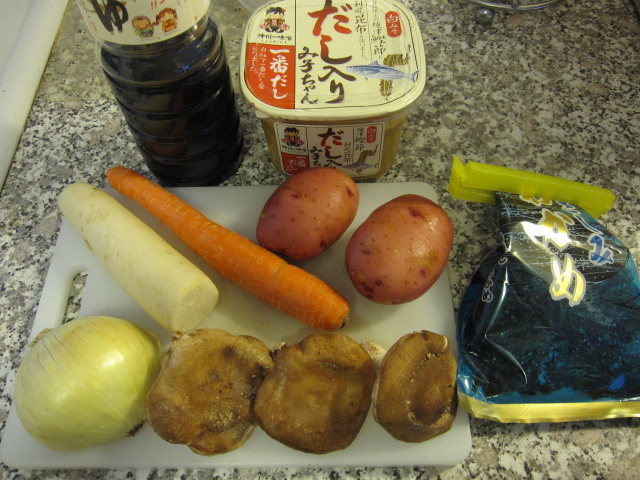 I used about 3.5 cups of water, 3 tablespoons of dashi soy sauce, 1 tablespoon of miso, 1/2 onion sliced, some daikon chopped, 1 carrot chopped, 2 red skinned potatoes skinned and chopped, 3 shiitake sliced, and some salted wakame rinsed and soaked.